Focusing on a few basic requirements and a general understanding of the plants needs, will turn a fish only tank into a wonderful aquatic landscape. A good substrate consists of two layers, designed to hold and provide minerals essential for the plants. A mixof laterite and potting soil for the lower layer (2-3 inches) will ensure a reservoir of minerals, while the top layer can consist of sand or gravel (1-2 Inches). Waste particles are easier to separate from gravel when siphoning the substrate. Plants need light for photosynthesis. Fluorescent light is usually recommended since it is primarily in the red and blue spectrum. The red spectrum promotes photosynthesis. A combination with full spectrum lighting might be advisable. Depending on the plant, 2 watts per Gallon should be sufficient, deeper tanks and/or plants requiring more intense lighting may need 3 watts per Gallon. As the light is the energy source, it should be kept on for 10-12 hours daily, and should also be uniformly distributed throughout the aquarium. Substrate, light and CO2 are the main factors for successful plant growth. CO2 is provided by fish perspiration but sometimes not enough. CO2 is needed for photosynthesis. CO2 requirements vary depending on the plants as well as on the plant to fish ratio. A test kit is advisable and adjustments are fairly easy to do. Self-made CO2 reactors are easily made. If you know the values of carbonate hardness (KH) and pH, the CO2 level of a planted tank can be calculated. The ideal CO2 value is between 5-20 ppm. Levels exceeding 30 ppm may result in respiratory problems for the fish. *(KH levels are in degrees/ CO2 in mg/l (ppm)) Example: A pH of 6.6 and a KH of 3.0 result in a CO2 concentration of 22 ppm. Plants will not be able to utilize minerals and light at a low CO2 level. Another very important aspect is the pH level. CO2 injection will lower your pH if you have soft water (water hardness). Keep a close eye on the pH during the first hours of a CO2 injection, or until it is leveled. Nitrogen, calcium, magnesium, sulfur, potassium and phosphorus (macronutrients) are needed in larger amounts. Iron, zinc, cobalt, manganese, and others are needed in smaller amounts (micronutrients). Macronutrients are usually in ample supply in the aquarium water, micronutrients have to be added from time to time, and are best placed into the substrate. Airstones and pumps will lower CO2 levels through a chemical reaction. Plants should provide enough oxygen for your aquarium, eliminating the need for an additional source of oxygen such as an air pump. Surface turbidity will also deplete CO2, which means not every filter type is best suited for a planted tank. Undergravel filters are not recommended either, because of the difficulty to clean and more importantly because UGF’s will oxygenize the substrate. This will make some nutrients unavailable for the plants, since theycan take up nutrients more easily under oxygen free conditions. 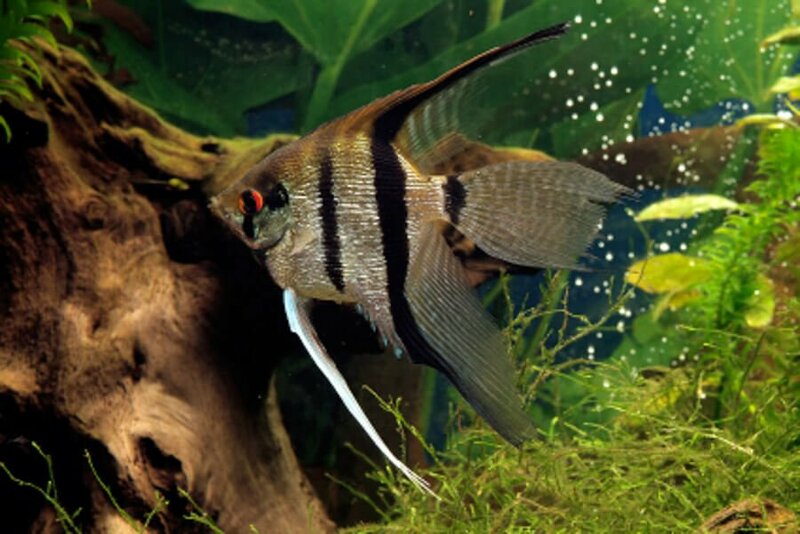 Compare the temperature requirements between your fish and plants. 80 degrees F is usually to hot for plants to flourish. Appropriate lighting, suitable substrate, and a CO2 level of 10-20 ppm should make for flourishing plants. If the plant growth is not adequate, adjusting one of these factors can do wonders. Please make sure to read our previous articles about water hardness, lighting and aquarium plants, for a complete understanding.